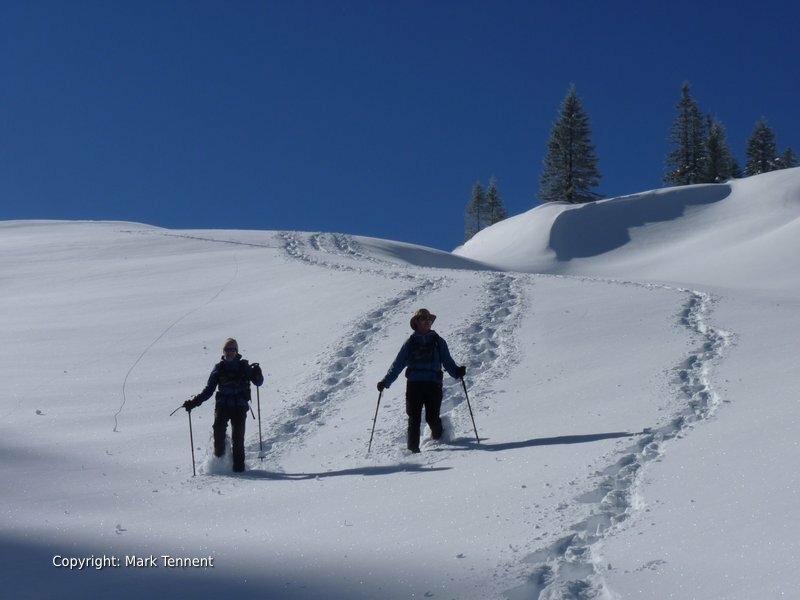 A 6 day snowshoe traverse of the Chartreuse mountains between Grenoble and Chambery. Spectacular limestone mountains and unspoilt, peaceful countryside. 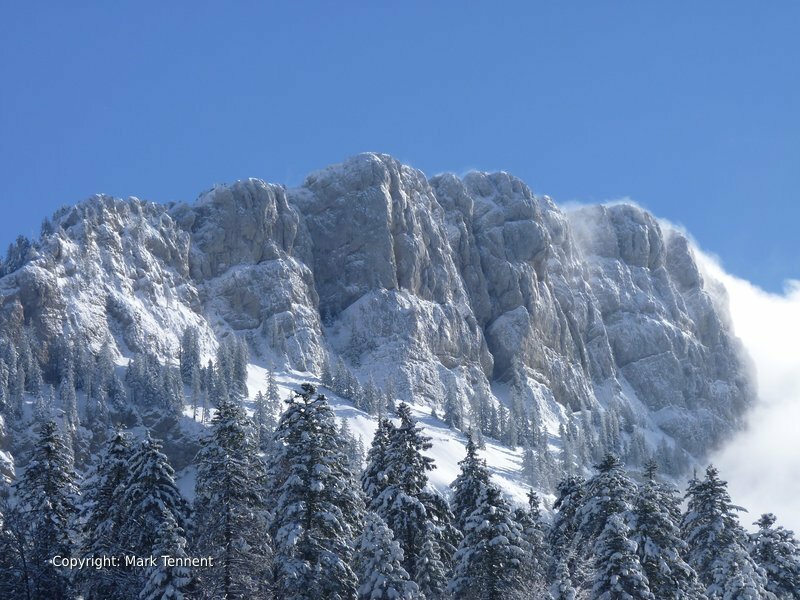 The Chartreuse Regional Natural Park – an unspoiled mountain environment preserving timeless traditions. Snowshoe past the Monastery of the Grande Chartreuse and the monks who guard the secret recipe for the Chartreuse liqueur! 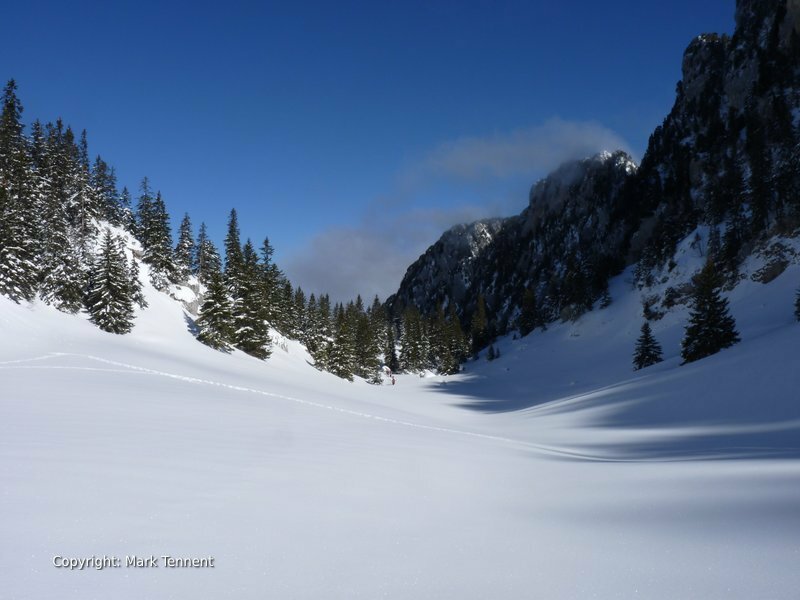 An amazing snowshoeing holiday adventure! 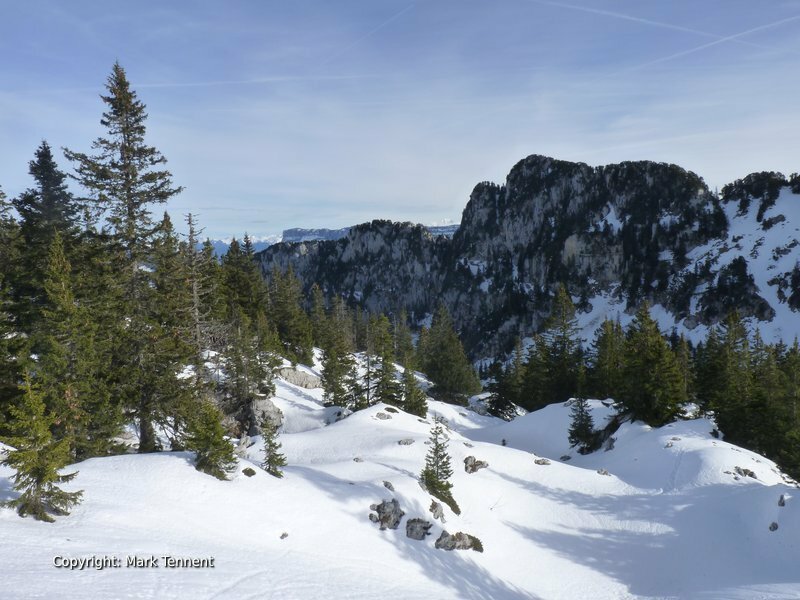 A great snowshoeing journey across the Chartreuse, an emblematic mountain range, part of the Pre-Alpes. 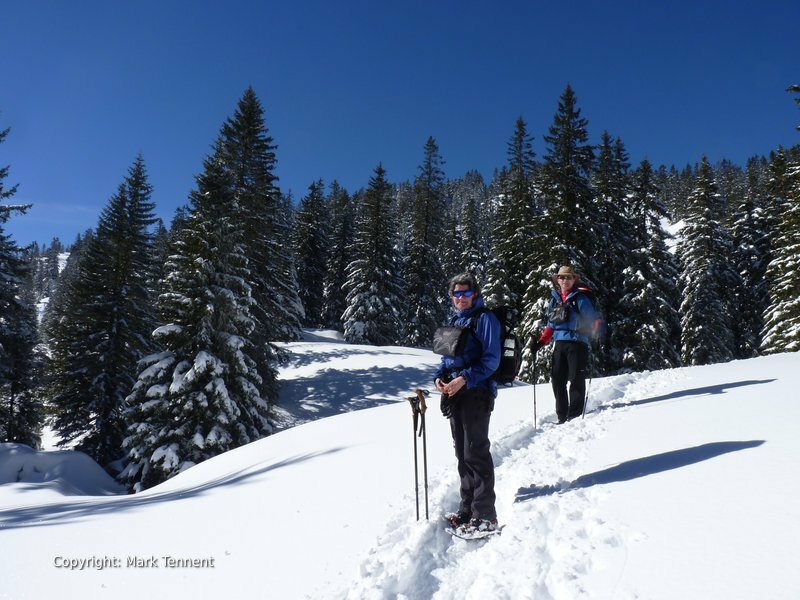 Our snowshoe traverse of the Chartreuse mountains starts just north of the city of Grenoble in the south and finishes in the Savoyard city of Chambéry in the north. 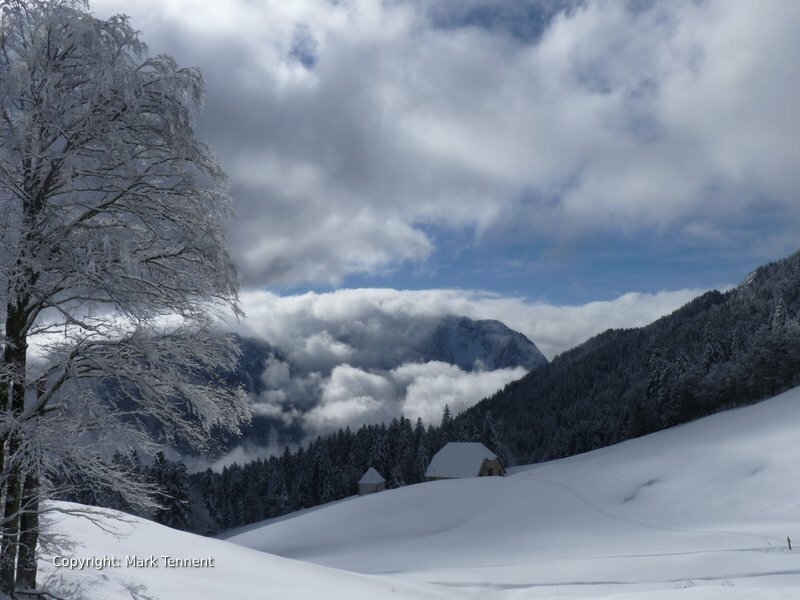 We will snowshoe through silent beech forests and through hushed alpine pastures underneath dramatic mountain peaks. As we make our way north we cross passes opening up new horizons. 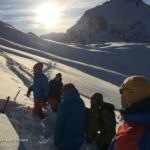 At times we will be snowshoeing through remote wooded valleys at others across snow-covered high pastures beneath spectacular limestone cliffs. Snowshoeing through the Chartreuse gives a special perspective to this area bypassed by the masses. The Chartreuse a true hidden gem! 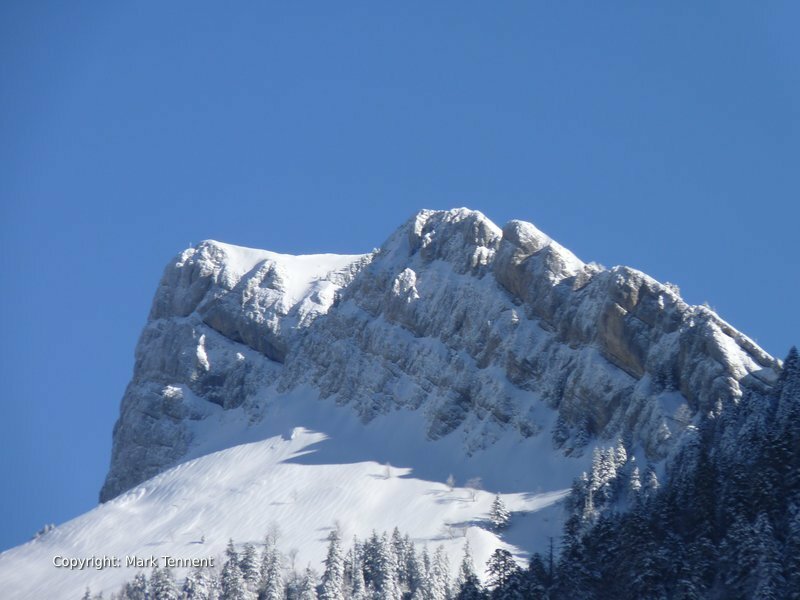 Above us the high limestone plateau of the “Hauts” Chartreuse are guarded by spectacular limestone cliffs. The Chartreuse is a countryside full of contrasts. The Chartreuse is know for the richness of its forests that include oak, beech and box. Higher up the beechwoods disappear and give way to sitka-spruce and stunted pines. On the high plateau, almost inaccessible in winter and much of it part of the Reserve Naturelle des Hauts Chartreuse, alpine pastures are home to flocks of sheep and cattle looked over by shepherds during the summer months. 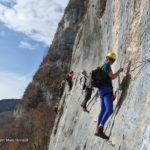 The plateau are characterised by limestone karst and an absence of water as it has all gone underground to emerge in spectacular fashion at the foot of cliffs such as the Cirque de St Meme. There is a huge diversity of plant life including over 50 species of orchids. The Chartreuse is a “Natura 2000” site. Beech woods bow under the weight of snow on the branches and alpine pastures under a mantle of sound-deadening snow. If we are lucky we spot some of the recently re-introduced ibex in the Cirque de la Plagne in 2010 and 2011. The Chartreuse is home to a variety of owls including the Tengmalm. 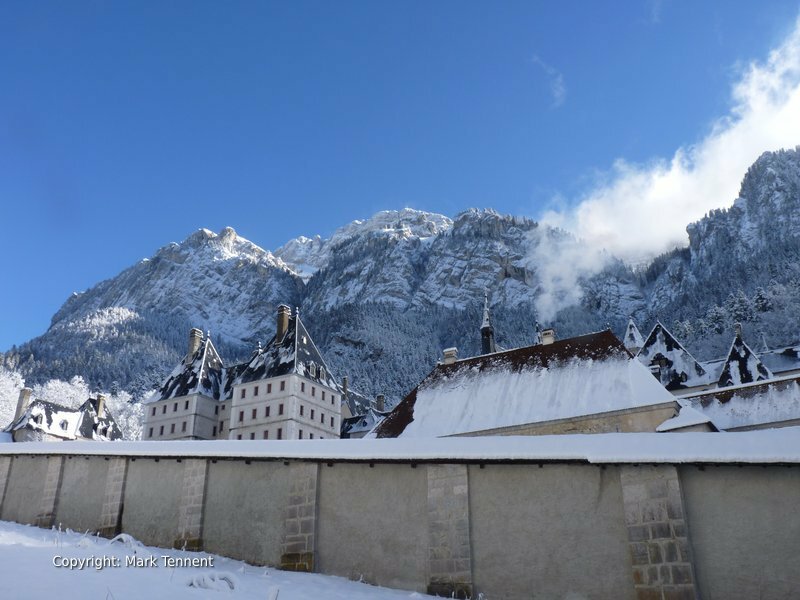 Our snowshoe traverse of the Chartreuse will literally take us past the the front door of the Monastery of the Grande Chartreuse, home to monks who still hold the secret recipe of the Chartreuse liqueur. 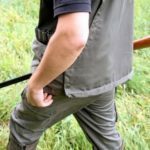 Sat – Arrival and transfer to Sarcenas by taxi. The auberge has a terrace with superb views south towards the Vercors. Sun – Today we explore the area above Sarcenas. Setting off directly from the terrace of the “auberge” we cross fields before climbing steadily towards the summit of the Pinea. Behind us the summit of the Chamechaude guards the Col de Porte. Returning along a ridge with great views we descend to the Col de Porte. A gentle descent takes us back to Sarcenas. Mon – Col de Porte – St Pierre de Chartreuse via Charmant Som (1 867 m). Setting off from the Col de Porte we follow a gently rising track through the woods with enlarging views as we gain height. Reaching the “alpages” we leave the woods below us and normally head for the summit of the Charmant Som. Retracing our route briefly our route descends steadily down before a track allows us to traverse easily through the forest. The way onwards passes other hamlets before a final descent takes us to St Pierre en Chartreuse. Overnight at hotel with dinner at a local restaurant. Tue – St Pierre-en-Chartreuse – La Ruchere. The monstery of the Grande Chartreuse is synomynous with the Chartreuse and the monks who produced the liqueur of the same name. Our route passes by the monastery in it’s secluded valley at the foot of the Grand Som. After leaving the monastery behind we gain the “alpages” and a gently rising traverse to reach the Col de Ruchere. Saying goodbye to the monastery we descend through woodland before reaching the small hamlet of La Ruchere. Overnight in a comfortable and homely, gite. Wed – La Ruchere – St Pierre d’Entremont. Today takes in the Col de Lechaud (1704 m) and, depending on conditions, the Petit Som (1772 m) that dominate the monastery. A short diagonal traverse brings us to a ridge and then a descent to the Col de Bovinant (1646 m). A long descent first in the open and then through woods bring us out to the hamlet of Le Chateau, the old residence of the Counts of Montbel, lords of the Entremonts before ending the stage at St Pierre d’Entremont. Overnight in hotel. 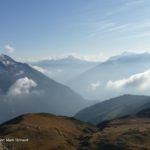 Thu – St Pierre d’Entremont – Cirque de la Plagne. St Pierre d’Entremont is located on the border of the Isere and Savoie departments. At one period the the village was shared between the kingdom of France and the Duchy of Savoie. A short distance from our hotel we cross the river and pick up a path that leads us up to pastures that allow us to traverse under the imposing cliffs of the Pinet. Disappearing into the woods we reach a track that brings us into the cirque de la Plagne. Overnight at the heart of the Cirque de la Plagne in gite accommodation. 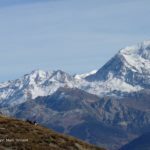 Fri – Cirque de la Plagne – Chambery. We follow the valley of the Entremonts at the foot of the west face of Mont Granier. At the Granges de Joigny (1185 m), we ascend gently through beechwoods to reach the Pointe de la Gorgeat. Our views extend beyond Chambery to the Lac de Bourget, France’s larges natural freshwater lake. A long, but gentle descent leads to the town of Chambery. Overnight in hotel.